I am yet to meet an individual who can fully convince me that he isn't scared of ghosts; ghosts and the Great Khali. It's a natural feeling to reach a point of heart-attack when someone encounters a ghosts. These encounters, however, have so far failed to be significant and are yet to provide solid evidence. Though, no one can assure us that ghosts do exist and many can prove to a certain extent that ghosts don't exist, it doesn't mean that we have stopped fearing them. The apparitions haunt us on dark lonely nights and in scary nightmare, the latter preceded by ice-cream on a hot dog. Fearing ghosts is pretty much an old thing, been there since ancient times, even during the time when MJ was a kid, free of any cases. If you fear ghosts, then don't be ashamed to admit it, because you are on the same boats as millions of people. This phenomena caused such massive hype and after-thought that people couldn't get enough of movies such as The Blair Witch Project, The Exorcist, The Shining etc. Its hard to survive through such movies, all alone at night, with or without pop-corn. Hell, its hard to live through Ap Ka Suroor, even during day-light, even though it doesn't have any ghosts, except one hideous, grotesque monster. Everything not funny aside, ghosts have been there as long as mankind, and though they may not dwell in the physical form, they are very much present in the spiritual form. 'I have spotted, or at least I think I have spotted something by the corner of my eye. And when this happens at night, it is really freaky' says 14 year old Samama Rahman, who is an avid horror movie viewer. And no matter how much fear one nurtures for the paranormal, we still have a penchant for them. But sometimes people wonder what makes ghosts so scary, especially after all the hype surrounding Casper the friendly ghosts, who is naked by the way. Just something that I thought I should bring to your attention. Moving on, exploring the reason behind the fear, there are two which experts have narrowed it down to. It seems people are afraid of what they don't know. We have heard tales, horrifying tales, feet at wrong sides, haunting tunes, misty surroundings, ghastly howls and everything, but we are yet to have an actually documented and almost proven case of an attack by ghosts. We have had sightings, we have had UFO sightings, but none is conclusive. But though stories of such are always circulating, people are inclined to believe them at one stage and accept that there are no possible counter-defense strategies, at least one that we have heard of. Therefore, due to lack of any 'protective spells', the fear grows. Many of us, accept and realize that our fears are irrational but that doesn't mean we can happily go to dark places or woods etc. We aren't slaves of our fears, but rather we are victims of it, and there is nothing chicken about it. I can say, without hesitation, that yes I am scared of ghosts and yes I do think strawberry is a tasty ice cream flavor, and this doesn't mean I am a wimp or I am a chicken. It just shows that I am brave enough to confront my fears and accept them, showing my strength (please believe me). But the inbred fear is clearly instinctive, as humans are prone to fear what they don't know. Of course if something does attack us, all of us a sudden, and we don't know how to conquer it, we will run for lives. 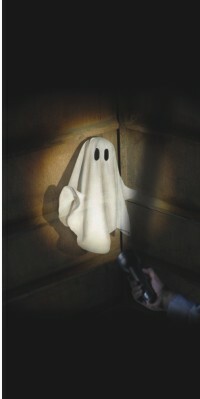 Its survival instinct and nothing chicken, and the fear of ghosts is just the fear of seeing them. Another reason for this is because, ghosts represent the dead, make us more aware of the fact that we will die, and people shy away from that. It is a terrible thought, to suddenly stop living. 'Seeing a ghosts will scare me, but I would hate to see one even more, because it will remind me that life for me will end…and even my loved ones would then fear seeing me.' Confesses 19-year old Jahan Farzana. So as long as we are alive and as long as our heart beats and adrenaline pumps, we will be fearing ghosts and we will be on the look-out for them. Till then, stay safe and keep it spooky.